Cooking is great. There’s nothing quite like taking a bunch of stuff, and turning into other, more delicious stuff. But sometimes life doesn’t let you cook. And lately, life hasn’t been letting me cook much at all. Luckily, I live in San Francisco, and not having time to cook just means I get to eat lots and lots of tasty things. Let’s talk about it. Monday started off strong with Ethiopian like you wouldn’t believe. Moya, the latest addition to the Chewse family, prepared a feast of stews, greens, and stir fry. I’m still dreaming about the Kik Alicha, Moya’s yellow pea stew that’s all at once creamy, spicy, and just a little crunchy. That night, I returned to Burma Love, the iconic Burma Superstar’s sister restaurant in the Mission. There’s nothing to wash away a case of the Monday’s like honey jasmine iced tea, tea leaf salad with extra fried garlic, and pull-apart, greasy platha bread. The team stuck around late on Tuesday night, triggering my inaugural Caviar experience. We ordered Wasabi Rice Bowls from Pacific Catch, a fish lovers dream come true. In between obsessive post-it brainstorms, we scarfed sesame poke, pickled seaweed, sushi rice, and salad topped with wasabi dressing that puts your favorite Japanese house salad to shame. Shame! On Wednesday, I finally checked Al’s Place off my SF restaurant bucket list. Tucked toward the end of Valencia street, this spot resembles a cool guys’ rent-controlled living room. Natural light, tasteful succulent incorporation, and an understated baby blue Birchwood color scheme make it feel both cozy and elegant. We went for the Family Style meal, which though promised wasn’t an exorbitant amount of food, left me wishing for a dolly to wheel me out. It started with “Snackles” my favorite of which were the “chickpeas a la catalan.” These pillowy chickpea fritters were melt-in-your-mouth fluffy with all the bold flavors of your favorite falafel. Also unforgettable was the grits dish, served with goat’s milk curds, green tomato, crispy corn, and padrón peppers. It’s all you want on a chilly night, which, thanks to Karl, was a shoe in. On Thursday, spirits were high in the office, and so were the SSISSO bibimbap bowls that we piled with the likes of salty japchae, harissa cucumbers, sesame-soaked beansprouts, and spicy pork. Not a leftover was left over. That night, the team piled into Lyfts and made our way to the Dogpatch, where heaps of meats and cups of mac ‘n cheese awaited at Magnolia. As the sun set over the lesser explored side of San Francisco, we sipped house-brewed beer, slathered pork butter onto sweet buns, and fought over every last bit of brisket. Dares were made and executed. Kamikazes were had. Hangovers, from beef and beer alike, were inevitable. Friday night ushered in a weekend of edible adventures, which commenced in Oakland with a 5-pound durian. Durian, for those lucky enough to not know, is a tropical fruit that looks a lot like a porcupine’s body and is filled with clumps of mucus-like flesh. 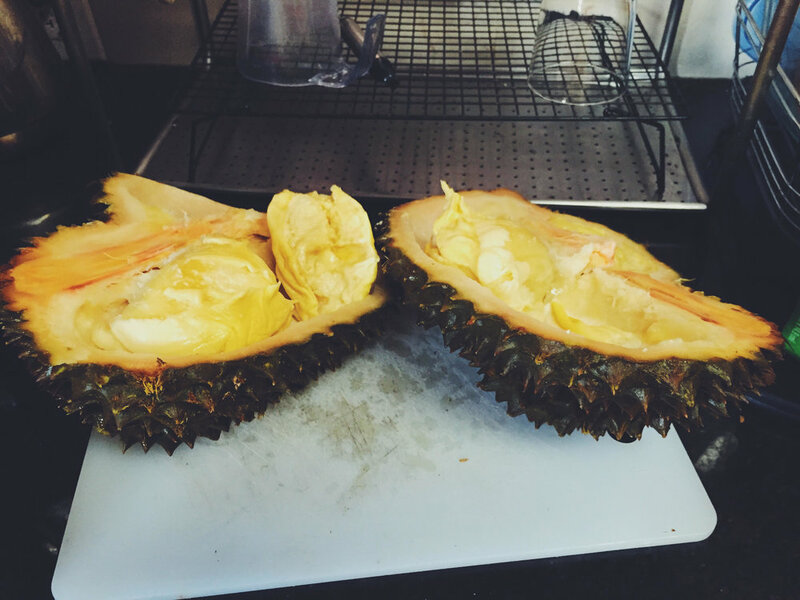 Durian is known for smelling like rotten garbage, which at first, seemed like a gross exaggeration. After an hour or so in the same room as the stuff though, I realized it was just gross. I went from being Durian’s new spokesperson, to literally wiping my tongue with a napkin to remove the taste. But it’s not so much the taste of Durian that’s so nauseating. Just like you experience a smoky flavor rather than taste it, Durian’s flavor affects you so deeply that taste is irrelevant. I was so traumatized that I deleted most of the photos of the thing from my phone, for fear of a relapse at the sight of it. Saturday was better, but just as slimy. Natalie and I hiked Mount Wittenberg in Point Reyes before driving up the coast to Hog Island Oyster Company for a post-trek treat. Unbeknownst to us, Hog Island is quite the destination, and all hopes of sipping rosé and slurping mignonette-topped bivalves were squashed by the apparent 4-month reservation wait time. Instead, we bought a dozen Kumamotos, a lemon, and some Tapatío. We borrowed an employee’s glove and knife and sat in the back of my VW shucking oysters, arms dripping in seawater, until the bag was empty. The grand total – $16. You can keep your mignonette for that price! That night, I put our CSA to work and kneaded up some purple potato gnocchi. Stay tuned for a post about how you too can eat purple pasta! After a classically “grounding” yoga class on Sunday morning, my Birkenstocks and I headed to Flowercraft, where we swooped up some summer treats, the likes of which have turned my back porch into a little slice of heaven. A watched pot never boils, but you know I’ll be staring at those little strawberries, padron peppers, and basil babies all summer long. The first basil leaves were picked and topped on thick slices of bright orange heirloom tomatoes, drizzled in olive oil and sprinkled with flaky salt and Parmesan cheese. We spent what was left of the weekend sprawled out in Dolores Park with a baguette, some homemade caponata, a bottle of rosé, and probably a lot of illicit activities that I was too blissfully unaware to notice. The sunset that night was enough to make you religious and was the perfect farewell to the weekend behind it. It was a week filled with old favorites, new flavors, and a little homemade goodness. Weeks like this make me feel honored to live in a place where great food is always a stones throw away, keeping me calm, happy, and very very full.